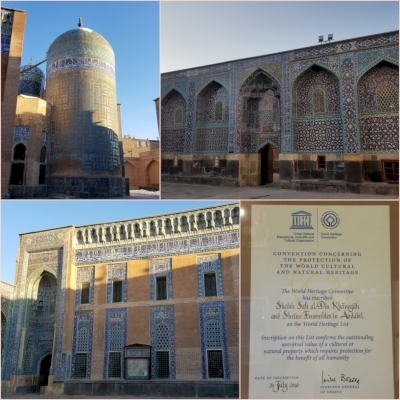 The Sheikh Safi al-Din Khanegah and Shrine Ensemble in Ardabil is a Sufi spiritual retreat dating from between the early 16th century and late 18th century. It is the burial site of Safi al-Din Ardabili (b. 1252/3), the eponymous founder of the Safawiyya order of Sufism. 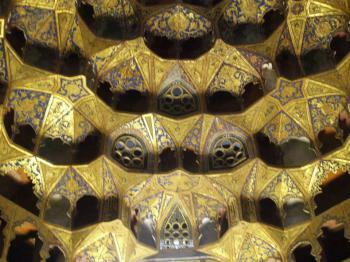 The complex is a fine example of medieval Iranian architecture. The shrine was an important site of pilgrimage throughout the Safavid period (1501-1722) and underwent numerous improvements and embellishments to become one of the most beautiful of all Safavid monuments. The site includes a library, a mosque, a school, a mausoleum, a cistern, a hospital, kitchens, a bakery and some offices. The Sheikh Safi al-Din Khanegah and Shrine Ensemble in Ardabil is a 16th century Iranian Sufi sanctuary with an especially cumbersome name. It is shortened in the nomination file and at the site itself to ‘SKSEA’. I had it registered at this website under ‘Ardabil’, but to be clear: it’s not the whole city that is included in the List – only a specific religious ensemble. Ardabil was the first city that I visited during my Iran trip. It is a sizeable provincial capital in the far northwest of the country. I arrived here from Azerbaijan via the Astara border post, somewhat of a back door to the Islamic Republic of Iran. The Sufi complex lies in the center of town. It doesn’t look particularly noteworthy from the street. Most of it is hidden behind brick walls. A smallish gate, decorated with distinctive glazed tiles, houses the entrance. I arrived early in the morning, and there were hardly any other visitors. Via the garden there’s another gate to tackle, and then the site opens up to you. The courtyard of the religious complex is surrounded on all four sides by buildings which are covered with blue tiles with green and yellow accents. This was my first example of Iranian architecture and I immediately knew it was a wise decision to come here. The three towers, that hold the mausoleums of the most important Sufi’s that are honoured here, are almost overlooked among all the splendour. Yet they are the most special thing about this complex. The oldest tomb tower (that of Safi al-Din) lies half-hidden behind the other two. It is currently being restored. The biggest of the three has the wonderful name 'Allah Allah Tower' - it is decorated with countless times the word 'Allah' in Arabic calligraphy. After removing your shoes you can cross the threshold to go inside. A beautifully decorated room awaits with an unexpected colour scheme. Gold, dark red and blue are the main colours. The space itself is a prayer room, surrounded by several niches containing the tombs of the deceased who are honoured here. The ceiling under the domes is covered with "stalactites" which serve as reinforcement of the structure. In addition to the main prayer room, the Porcelain Room is also very worthwhile. This is a large space in the shape of a cross, where the walls are covered with small niches in a variety of forms (such as a violin or a vase). In 16th and 17th century these niches (there are perhaps 1000 of them!) were filled with Chinese porcelain, received as gifts or robbed by the Safavid rulers. Most of it is now gone to great museums in Tehran, and the famous Ardabil-carpet that formerly covered the entire floor of this room has landed in London. In the outdoor area at the back of the complex it is worth having a look at the 'school’. Here teachers taught various religious and secular subjects, and they did so by speaking to their students (1 or 2, sometimes 5 at a time) from a niche in the outer wall. The wall now has some 30 of these niches, most with a special platform in it to elevate the teacher above his pupils. This is purely a Sufi sanctuary, but it has Shi’a connotations too for the Iranians. The Safavid dynasty responsible for this ensemble promoted Shi’ism to the state religion. In its nomination, Iran proposed inscription on an additional criterion 6 to honour the special meaning that the site has for the country. But this was brushed away by ICOMOS which did not see the universal relevance of this. The rest of its OUV was easily accepted. My last Iranian WHS to visit and I almost missed it. The entrance to the site is not clear. I walked past it and reach what appeared on the map to be the tomb with a tiny sign pointing left to where I came from, but actually it looked more like it was pointing at some construction and I figured "oh no, another closed WHS in winter". So I walked into the next alley, nothing. Then I turned into the courtyard on the way back which is actually the archaeological museum and already closed. The young guard led me to the right place in the OTHER courtyard. I was immediately taken by the nice garden and outer architecture but it doesn't quite prepare you for what you see inside. The tomb is marvelous yet the highlight is the next, bigger room, with your eye exploring each niche of the prayer rooms. Pictures are not allowed inside yet a friendly nod allowed me to snap the inscription certificate, but unlike other reviews I didn't have the encourage to pull out my camera when the staff is not looking. I spent half an hour in the area, more than most people probably do, making two trips through the rooms. Surely one of the highlights in Iran. And once you are in Ardabil you cannot miss the Shrine -it is right in the middle of the city centre. From outside it does not offer too much - a regular blue-tiled religious building that you can see every now and then in Iran. But as you enter - there is an entrance fee for foreigners - with every step it is getting to be more and more miraculous. Safi ed-Din is one of the most impoartant figures of the iranian history. His descendats, the Safavids, shaped iran to what it is now. They introduced the Shiite form of Islam, that is now the state religion of the country. Sheikh Safi-ad-din Is'haq Ardabili was the Kurdish eponym of the Safavid dynasty, founder of the Safaviyya order, and the spiritual heir and son in law of the great Sufi Murshid (Grand Master) Sheikh Zahed Gilani, of Lahijan in Gilan province in northern Iran. Most of what we know about him comes from the Safvat as-safa, a hagiography written by one of his followers. Sheikh Safi al-Din's has composed poems in the Iranian dialect of old Tati.He was a seventh-generation descendant of Firuz-Shah Zarrin-Kolah, a local Iranian dignitary. 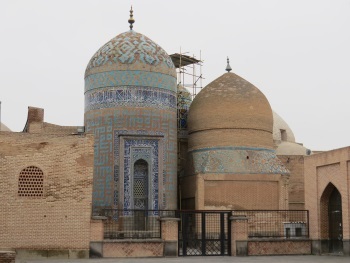 The Mausoleum of Sheikh Safi, in Ardabil, was first built by his son Sheikh Sadr al-Dîn Mûsâ, after Sheikh Safi’s death in 1334. It was constructed between the beginning of the 16th century and the end of the 18th century. The mausoleum, a tall, domed circular tower decorated with blue tile and about 17 meters in height; beside it is the 17th-century Porcelain House preserving the sanctuary's ceremonial wares. he most interesting and stunning part of the building is the interior of the shrine. The blue and gold ornamented tiles are miraculous. The shriene can be the highlight of any tour in northern iran, well worth the detour from Tabriz. February 2012, its the moment of decision. To go or not to go to Iran. I had booked this trip a while ago but did not anticipate that the political situation was so tense at this time. Israel is assumed to be ready to bomb the nuclear sites in Iran as early as April and the US could be dragged in via the Straits of Hormuz etc. Added to the fact that the US does not have an embassy in Iran makes it even more tricky. In the end I decided that March is a window of calm and off we went. This is not a forum for discussion on politics but I am now convinced that religion and politics should never be in the same room. Political power through religion is extremely dangerous. Ardebil has been a 'pilgrimage' goal of mine for over 20 years because of the collection of Chinese porcelains (to be discussed later). It happens to be the mausoleum of a Sheikh Safi-Od-Din. He was credited of turning Iran away from Sunni Islam to Shite Islam and so the shrine is a pilgrimage site to many religious people in Iran. The complex is not huge but the decoration is delicate and beautiful. It was built by Safi-Od-Din's grandson to honor his grandfather during the Safavid period and its importance grew over time. The entry is through a formal garden complex over 100 meters and through a door into the courtyard surrounded by facades of blue tiled motifs. The shrine is a building in front with a domed Allah-allah tower because the wall of the tower is decorated with the stylized blue tile word of Allah. To the left and right are huge iwans decorated also with tile work. The left iwan is the entrance to the kitchen and I am not sure about the right building. As you enter the shrine you are faced with a long prayer hall called Ghandil Kaneh or lantern house. The decoration is brilliant gold paint with open rooms on the left side with stalactite roof decorations. At the end of the hall is the wooden sarcophagi of the sufi. To the left of the hall are passageways to the next room which is Chini Kaneh or the China Room. This is an octagonal room that is domed. The walls above 3 meters from the floor are completely covered with 8-10 tiers of stucco niches carved in the shape of vases, plates and bowls for the display of Chinese Porcelains. There must be about 1000 niches on all eight walls. On the floor of this room is a reproduction of the world famous Ardebil carpet. A small photograph of the original states that it is now in the Victoria and Albert Museum in London. Ardebil Carpet: According to wiki there were originally two identical carpets each 10.5 meters X 5.3 meters with 26 million knots at 500,000 knots per sq meter. The carpets were made in the 16th C and in 1890 they were both sold to a British carpet broker in poor condition. He then restored one carpet by cannibalizing the other and sold the restored carpet to the V&A. The second carpet that is now smaller than the original was eventually sold to J Paul Getty who later donated it to the LA County Museum. Many copies of this carpet's design has been made over the centuries and as such it has become world famous. Chinese Porcelains: I have been a amateur admirer of Chinese Porcelains for many years and have travelled the world to admire them in museums. It is an incredible fact that the best collections of Chinese Blue and White Porcelains in the world are at Istanbul (Topkapi) and Ardebil. The reason is because of the silk road. When Marco Polo and others travelled the silk road, it was already a path of incredible commerce between the China and the west. Naturally, Iran and Turkey were the entry points to that commerce. At the time of the 14th C, the Chines potters invented a technique to make under glaze blue and white porcelains using cobalt paint. The rest of the world would not discover the secret to making high fired porcelains like the Chinese for another 400 years! Most of the pottery in the middle east were low fired pottery clay ware. As such the Chinese porcelain ware was worth its weight in gold as it has to travel for thousands of miles over land in one piece to get to Iran. The collection at Ardebil was built up by Shah Abbas I and he donated over 800 pieces to the Ardebil shrine. The most magnificent pieces are all from the 14-16th C. There are currently about 100 pieces on display in display cases around the Chini Kaneh. These are some of the best in the world but they are all mislabeled as 17th C.
When the sea routes open to China, Europe then built up collections of 18th C Chinese Porcelains. I have now made it to Topkapi and Ardebil. The site is easy to find in the city center of Ardabil. Ardabil lies some 600km northwest of Tehran.